In stock on May 3, 2019. Order it now. Sold by The StoreFront and Fulfilled by Amazon. Gift-wrap available. Sold by The StoreFront and ships from Amazon Fulfillment. Ships from and sold by Uncle Dan's Dips, Seasonings and Salad Dressings. Kumana Avocado Hot Sauce. South American Sriracha. A Vibrant Hot Sauce Made with Ripe Avocados, Mango & Habanero. Paleo Friendly & Keto Approved. No Sugar Added. 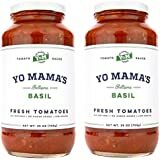 Gourmet Natural Tomato Basil Pasta Sauce (2) 25 oz Jars – No Sugar Added, Gluten Free, Preservative Free, Keto and Paleo Friendly, and Made with Whole, Non-GMO Tomatoes! Your salad doesn’t know what it’s been missing, and neither do your taste buds. Using your own fresh ingredients, Uncle Dan’s® Classic Ranch Salad Dressing can be made in minutes, or can be used as a seasoning in a variety of recipes. Uncle Dan’s® Famous Original Southern Classic Ranch Seasoning and Salad Dressing Mix has been a Pacific Northwest favorite for over 40 years. One taste of this ranch salad dressing, originally known as American Salad Dressing, and you’ll find out why Uncle Dan’s® is so popular. The key to good tasting salad dressing is to make it fresh with your own ingredients. 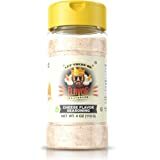 We select the finest herbs and spices and combine them into our secret, award winning, GLUTEN-FREE, buttermilk ranch salad dressing mix formula. Uncle Dan’s® dressing and dip recipes allow you the flexibility to control fat and calorie content. You know the importance of eating enough vegetables and you can use Uncle Dan’s® low fat (or fat free) Ranch Salad Dressing or Ranch Dip to enhance the taste of your favorite veggies. 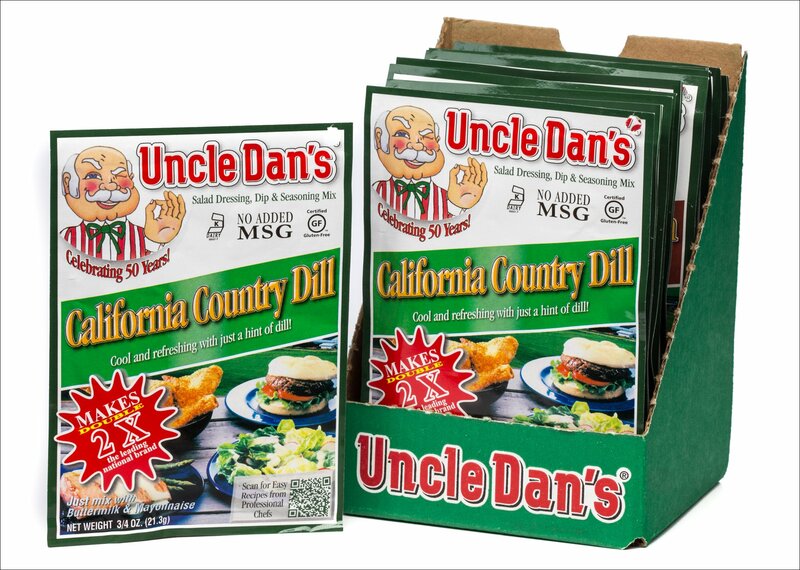 Eating vegetables with Uncle Dan’s® is a low calorie alternative to eating processed junk foods without sacrificing taste. 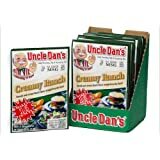 Uncle Dan’s® Salad Dressing and Salad Dressing Mixes are the most versatile seasonings available. 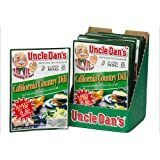 Discover the variety of uses for Uncle Dan’s® Classic Ranch Seasoning and Salad Dressing in recipes for Baked Chicken, Broccoli Salad, Twice Baked Potatoes, Southern Garlic Bread, Biscuits and Gravy, Chicken Salad and much more. Once you try Uncle Dan’s® we’re sure you’ll agree that it’s the best Ranch Salad Dressing and Ranch Party Dip you ever tasted. If not, then we guarantee the flavor and will buy it back from you no questions asked. Thanks for trying Uncle Dan’s® Salad Dressing and Dip Mix Recipes. This is the best ranch dressing and dip you will ever make. Everyone that tastes it raves about it. Mix with sour cream and mayo for dip or mayo and butter milk for dressing. Wish you could buy less than 12 but usually split order with a friend or my daughter. 5.0 out of 5 starsZe Best! The absolute best! We've used it for years, but hard to find in local stores. Now there are so many new flavors and new packaging. To make thicker dressing use mayo and sour cream recipe thinned with a bit of milk. To make half a recipe, use three teaspoons of mix. 5.0 out of 5 starsThe best dip ever! Love Uncle Dan's! Didn't think I'd ever find this was available. 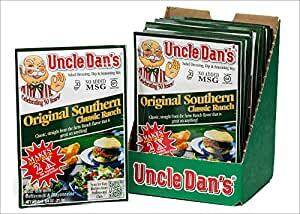 Our friend lived in Iowa years ago and brought Uncle Dan's to Massachusetts. We all loved it. 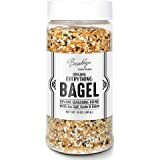 I searched on Amazon and there it was! Surprised my daughter with a box....she flipped out! It is the most delicious dip and dressing ever. 5.0 out of 5 starsUncle dan ranch dressing. I have used uncle Dan ranch dressing for salads for a long time when j could buy in stores. My nephews & neices love uncle dan. Dislike, not having the divided pop package. For one person. It hard to use up 4 cups of dressing. When measuring out for a 2 cups it never taste the same. 5.0 out of 5 starsFavorite ranch dressing! 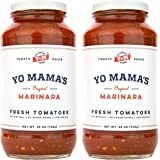 By far my favorite ranch seasoning for homemade dressing that I have come across for someone who puts ranch on almost everything. Excellent ranch/dill flavor. Makes a great buttermilk dressing. A friend made this while on a vacation and I ordered an entire case the moment I returned. 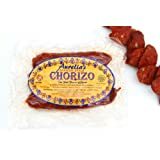 Lasts about 3-4 weeks in the fridge which makes it perfect for one packet a month! 5.0 out of 5 starsVery good ranch! Wanted to try this as the reviews were so good. I love ranch dressing but I don't buy it, because of the msg. 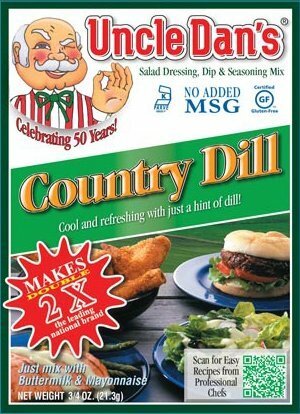 This dressing is delicious and does not add msg. Glad to find this product. 5.0 out of 5 starsYUMMY! Forget other ranch style dressings - this is the best EVER! Worth a little extra $$ for so much more flavor! I use sour cream and mayo Duke's, if I can find it!)! 5.0 out of 5 starsThank you for the shaker! Thank you for making the option for the shaker jar! I use Uncle Dan's Ranch sprinkled on my chicken before putting it in the oven to bake. With the shaker jar I can add just the dusting without having to cut open the foil packet, and then try to figure out how to roll it up so that it doesn't spill out until I need it for the next time I'm making my baked chicken.